You can make your own website today! A common misconception is that in order to make a website you first need to learn complicated coding. What if I told you that most of the websites created today involved no coding at all from the website’s owner? What if I told you that you could make a website in an afternoon? What if I told you that creating pages for your website was as simple as writing a Word document? What if I told you all this was possible for a fraction of the cost of hiring a professional web designer? In this seven part ultimate beginner’s guide we’ll take you step by step through the process of how to make a website of your own on even the smallest budget. Follow along and start your website today! Every major website you visit on a daily basis is powered by a Content Management System (or CMS). The CMS is a piece of software installed on your host (more about hosting later) that allows us to separate the content and functionality of our website. Quickly add new content to our website. Instantly change the look of our website though the use of themes and templates. Extend the functionality of our website through plugins. …all without touching a single line of code. There are loads of platforms to choose from. However, there is only one that we can wholeheartedly recommend because it stands head and shoulders above the rest. Did you know WordPress is used to power more than 15,000,000 websites?! There’s a reason why over 15,000,000 websites (including some of the biggest around) are created with WordPress. There’s simply no better or easier way to build a website. You can download, install, use and modify WordPress without spending a penny making it completely risk free. If you’ve ever used a word processor like Microsoft Word or written an email you already know how to add content to your site using WordPress. For more experienced programmers it’s infinitely customizable through a simple template system and plugins. The real magic of WordPress is it’s plugins, and there are thousands of them you can use for FREE. If there is something you need your website to do that WordPress can’t do straight out of the box there’s probably a plugin that will add that feature for you. Sliders, image galleries, contact forms, newsletter signup forms, membership subscriptions or even an entire online store are all possible via plugins and ZERO coding. WordPress is amazingly versatile and scalable to suit just about any need. So whether you’re building a personal blog, an online magazine, a company website or an online store WordPress can handle it. Did you know that more time is spent viewing web pages on mobile devices than PCs and laptops? Pick the right WordPress theme and your website will be mobile ready from the start. Those visitors on mobile devices will have a great experience using your website. WordPress has a massive international community. With such a huge user base there’s a network of thousands of people all over the world who are contributing to WordPress through coding for the WordPress core, free and premium themes and plugins, and entire websites dedicated to WordPress tutorials and advice. Help is always easy to find if you ever find yourself stuck. Some people who are new to WordPress are unsure what the differences are between WordPress.com and WordPress.org and which they should be using for their website. WordPress.com allows you to signup for your own WordPress powered website for free but with some significant differences and limitations unless you opt for paid upgrades. The first obvious difference is that your website will be hosted by WordPress.com and you do not have access to your website’s files. You are also limited to only using free themes and plugins available through the WordPress repository. Your website domain name will include “wordpress” (e.g. yourwebsite.wordpress.com) unless you pay for a domain name upgrade. WordPress.org is where you can download your own copy of the open source WordPress CMS for free. Because your website will not be hosted by WordPress you will need to arrange your own hosting (we’ll show you exactly how to do that later in this guide). With WordPress.org you are free to modify WordPress, theme and plugin code as much as you like. Once you have taken into consideration all the paid upgrades you would need with a WordPress.com hosted website it works out more economical to host your website yourself. You also get the additional benefits of being able to use any theme or plugin without restriction and access to your website’s files. A domain name – so that visitors can find your site. Web hosting – so that your website has somewhere to “live” on the internet. In this part of the guide we’ll be shortlisting and selecting the perfect domain name for your website. The domain name is the address visitors will use to find your website (like www.google.com). Unlike the CMS you will have to pay for a website domain, although not always right from the start. Registering a domain usually costs less than $10 a year and many website hosts offer the first year for free (or discounted) should you decide to register your domain through them. Using your own domain name rather than one attached to a free or budget hosting service (e.g. yourwebsite.free-websites.com) comes across more professionally and trustworthy to visitors. The domain name is usually a visitor’s first impression of your website so it’s important it meets certain criteria. If you’re creating a website for an existing business it’s likely your domain name will be the same as (or similar to) the name of the business. However, if your website is for a project you are just creating you have the freedom to choose a completely new domain name. You want to make it as easy for visitors to recall and type your website’s address as possible. The shorter your website address is the better. When selecting your domain you will be presented with lots of alternative domain extensions besides the traditional .COM, .NET and .ORG that are aimed at specific categories such as .TRAVEL .PHOTOGRAPHY and .STORE. Most people wouldn’t recognize these as website addresses. When picking a domain name it’s best to consider .COM. The reason for this is because if the .COM is not available, and you choose one of the alternatives, it means there is a website out there with an almost identical name that can easily be confused with yours. If the .COM is taken but is not being actively used by a website you could use the .NET. Early traffic to your website will be through links and searches so there’s less opportunity for confusion. If your website is for an organization or business that only operates in one country (where international visitors are less likely) you could use the country code domain extension. For example, if your website is for a restaurant in France you would be better off using the .FR domain extension. This relates back to making your website’s address easy to remember. By intentionally misspelling words in your domain name you are increasing the chances of a visitor not being able to find your website. Also, if you choose to use a misspelled version of a domain name that is already in use there is potential for you to lose visitors to a direct competitor if the visitor types the correct spelling into their web browser address bar. “You should only go with a ‘niche name’ when you’re confident that you’ll be exclusively addressing that niche market for the lifespan of your company”. Today www.cheaptelevisions.com might sum up your website perfectly but what about in a year or two when you start to also sell kitchen electricals? Don’t limit your website’s potential by selecting a name that is too specific. Avoid using numbers in your domain name where possible because it adds the possibility of confusion. Someone hearing the address spoken won’t know if the number is supposed to be written numerically (1), or spelled out (one): FiftyIdeas.com or 50Ideas.com. If you use someone else’s trademark in your domain you are risking legal action beginning with a Cease and Desist Letter. In the event of a C&D you will have to stop using the domain name or try and fight for the right to use it through the courts. Website addresses with hyphens lack the credibility of non-hyphenated URLs. Spam websites have used domains loaded with keywords separated by hyphens in an attempt to rank well in Google search results for several years. This perception still exists today. Domain names that include hyphens also fail the “brandability” test. Ask yourself if the domain name sounds like a reputable brand. Could you imagine the name written on a sign outside a company office or above a store? Finding a great domain name can take some time because most of your ideal choices will be unavailable. Here are a few steps and tools that will help you find your perfect domain name. Brainstorm a list of words related to your topic area that you would like in your domain name. The longer this list is the easier it will be to find an available domain name. Let’s say you are creating a website about cars you would list words like “car”, “vehicle”, “auto”, “gear”, “engine”, “fast lane”, “road”. Domain names using combinations of words from our initial list of related words and phrases will most likely already be taken. So we need to go one step further and add non-related words, prefixes and suffixes. Some examples would be “central”, “think”, “smart”, “-ily”, “-topia”, “expert”. Now you have a larger list of words and modifiers you can start combining them and checking for their availability. Here are a few online tools you can use to automate the process of combining words to come up with domain names. With your list of names in hand you can check their availability on any domain name registrar website (two options are NameCheap and GoDaddy), but do not buy your domain name yet. Using the above steps you should be able to come up with a list of potential domain names that are available. Now all you have to do is pick the one you like the best. Do not purchase the domain name yet. A lot of web hosts offer free (or discounted) domain name registration for the first year so we will be purchasing the domain name together with the web hosting package. When registering a domain name you must provide contact information including an address, email and telephone number. This information is publically available to anyone who does a WHOIS search for your domain name information. Domain name privacy (or WHOIS protection) is offered as an optional extra (for a small fee) by any company you can register a domain name through. With domain name privacy your personal details are replaced with the domain registrars details in the domain name’s publicly available details, so anyone who wants to contact the domain name owner directly must first go through the domain registrar. Domain privacy is worth the small investment, especially if your website’s domain information will be your home address and personal contact information. Where do I register my domain name? Domain names can be registered either separately through a domain name registrar or from a web host at the same time you purchase your website hosting. As mentioned previously most web hosts offer discounted or free domain names for the first year of your hosting plan. If you choose to register the domain name separately from your website host you will need to take extra steps to link your domain name from the domain name registrar account to your website host account. It is for this reason that it is recommended that beginners register their domain name through their website host. Come up with a list of available potential domain names for your website. Select your favourite domain name from your list. Simply put, web hosting is a place for website owners to store their website’s files. Web hosting services manage a high-speed network of servers/computers so that your website can be accessed reliably and at any time by visitors. When someone types in your website’s address or clicks a link to your website it is the files on the web host’s servers that they see in their browser. Web hosts manage everything to do with the maintenance of the servers including, but not limited to, its software, security, optimization and much more. There are four main types of hosting: shared, virtual private servers (VPS), dedicated and cloud hosting. Each of the four types of hosting performs the same function (delivering your website’s files to your website’s visitors), however, each comes with its own advantages and disadvantages that will make them suitable for different uses and websites. With shared hosting, multiple websites are placed on the same server. The number of websites on the same server can range from a few hundred to thousands. Websites on the same server typically share the server’s resources. Shared hosting is the most popular type of hosting due to its low cost. The biggest drawback of shared hosting is that other websites can affect the performance of your website due to the pooled resources. Shared hosting can be bad at handling high volumes of traffic and sudden spikes. A virtual Private Server is when a server is divided into virtual servers and each website is allocated its own dedicated section. It can be seen as a mix between shared and dedicated hosting. The advantage to Virtual Private Servers are that the individual “sections” that each website uses can be better customized for their site’s specific needs. Like shared hosting VPS hosting can be bad at handling high volumes of traffic and sudden spikes. With dedicated hosting, you rent an entire server to handle just your website’s traffic. Dedicated servers offer the maximum amount of control and customization. The performance and versatility come at a cost. Dedicated servers are expensive and only necessary for websites or services that handle huge amounts of traffic and require greater control. Cloud hosting allows multiple servers to act as one system. Spreading workload over multiple servers improves performance and prevents a single point of failure (if one server goes down another can pick up the slack). Cloud hosting allows for flexible growth and performance stability, but can be more expensive than the alternatives. Which host should you use? Bluehost is a proven web host used by over 2,000,000 websites. They make the entire website setup process incredibly easy with one-click installations for the most popular web apps via the account Control Panel. On their Plus plan ($6.95/month) you can use a single Bluehost account to host multiple domains, so theirs no additional cost when you’re ready to start your next site. Bluehost offers great support at a price that can’t be beaten. Their shared hosting plans are extremely affordable starting at just $3.95/month and they offer free domain name registration for the first year. Sign up for web hosting with your chosen domain name. 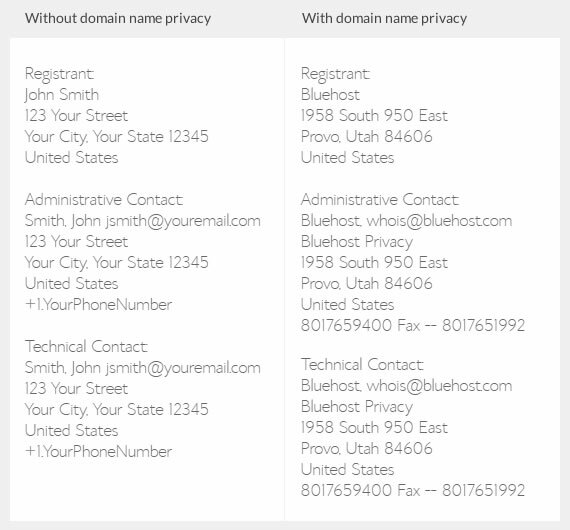 Don’t forget to consider Domain Name Privacy to protect your personal information. We recommend Bluehost. Get the first year’s hosting and a FREE domain name for only $3.95/month! Congratulations. You now have a website! You can view your new website by typing the domain name you choose into your browser’s address bar. There won’t be much there yet, but you should see a placeholder page from your web host. The next step to getting your website truly underway is to install WordPress. There are two ways to install WordPress: One-click installation or manual installation. Most popular and reputable web hosts include one-click installers for the most popular website software (including WordPress) making this part really easy. The appearance of the account control panel will vary slightly between different web hosts but the steps will generally be the same. Log in to your web hosting account. Go to the control panel (sometimes labeled “CPanel”). Look for the WordPress one-click installer icon. This can be listed a number of ways e.g. “Install WordPress” or ”One-Click Installs”. Choose the domain where you want to install WordPress. There should only be one domain to choose unless you have registered multiple domains to your web hosting account, or created sub-domains. If there are advanced options available you can also fill in your website’s title and the admin user account username and password. Click the “Install Now” button. After a short wait the installation will be complete and you’ll see a link to your website. As you would expect, installing WordPress manually isn’t as quick as a one-click installation but it’s still relatively pain-free. Before beginning, you will need to create a new database for your WordPress installation. Unzip the WordPress files to your desktop. You should have a single “wordpress” folder. Find wp-config-sample.php and rename it wp-config.php. define(‘DB_NAME, ‘database_name_here’); - the database name. define(‘DB_USER, ‘username_here’); - the database user name. Using an FTP client (such as Filezilla) login to your hosting FTP account. Once connected navigation to the /public_html directory. If there is an “index” or “default” file you can delete it. Upload the files from inside the wordpress folder to your /public_html directory. Once the files are uploaded go to www.yourdomain.com/wp-admin/install.php. Fill in your website details and click the install WordPress button. You can find more detailed step by step instructions here. Log in to the admin dashboard and take a look around. If you’ve followed up to this point your website should now be starting to look like an actual website. If you go to your website’s homepage you’ll see that it’s using a default WordPress themes. Next we’re going to talk about what a theme is, where to find themes and how to install a theme. A theme is a package of template files which when installed and activated will change the appearance of your website. One of the many great things about WordPress is the staggering number of themes available for you to use. Changing themes can even be as simple as the click of a button. WordPress themes come in two types: Free and Premium. Free themes (as the name suggests) are free for you to download, install, use and customize. They are great for personal blogs because they are simple to setup and easy to use with no unnecessary frills. Some free themes are a “light” version of a premium theme with optional extras packaged as premium plugins or an entirely separate premium version with the extended features built in. Sometimes free themes lack the attention to detail you would get with a premium theme but there are certainly some great looking free themes out there for you to use. Premium themes can usually be bought individually as a one off purchase or as part of a subscription package along with other themes. Because premium themes are sold (rather than given away free for) they come with additional features and extras not present in free themes. These extras can range from features in the theme itself to third party premium plugins bundled with the theme. Premium themes are usually created by dedicated theme authors and typically the theme’s layout and design details play a more important role than they do with a free theme. Because of this, premium theme’s can have a small learning curve similar to what you would expect with some feature rich plugins. A huge selling point of premium themes is that they are really well supported by the authors. Since you are a paying customer most authors will go above and beyond to help you out if you have a problem or need some guidance using their themes. Where can I find themes? The best place to find free WordPress themes is the WordPress theme directory. There are tens of thousands of free themes listed here and every one of them has been through the WordPress theme review process so their code quality is guaranteed. If it’s a stunning premium theme you’re looking for the WebsiteSmash team have created some of our very own which you can check out here. Our themes are sold exclusively through ThemeForest (by far the largest theme marketplace around) and boast some of the best support you’ll find anywhere. All themes sold on ThemeForest go through a review process to ensure great design and code quality. Log in to your WordPress website dashboard. Go to the Appearance > Themes page. You will see a list of all currently installed themes. Click the “Add New” button above the list of themes. You will navigate to the WordPress Theme Directory search. Here you can sort through free themes using filters and keyword search. When you’ve found a theme you like just click the “Install Now” button on the theme. After a few seconds the theme should have finished installing. You can activate the theme by clicking the “Activate” link below the successful installation message. When you purchase a premium theme you will be given a link for you to download the theme files. The theme should come in a .zip file (inside you should see a style.css file with lots of other files and folders) that you then upload to your WordPress website. Go to the Appearance > Themes page. Click the “Add New” button above the list of themes. You will navigate to the WordPress Theme Directory search screen. Click the “Upload Theme” button at the very top of the screen. Click the “Choose File” button and select the theme .zip file. Then click “Install Now”. After a few seconds, the theme should have finished installing. You can activate the theme by clicking the “Activate” link below the successful installation message. Remember switching themes will not affect the content of your existing pages or posts so you can change and test out new themes whenever you like without worrying about losing anything. Congratulations! You just made your own website! Now that your website is online here are a few things to look into that will help you to attract visitors. Add content to your website. Tell Google about your new website by registering it with Google Search Console. Take a look at our list of must-have WordPress plugins. Sign up for Google Analytics and add the tracking code to your website to track website traffic. Research link building strategies to help power up the Google rankings. Begin to build a following on social media. Research Facebook, Twitter and Instagram advertising to spread the word and grow your mailing list.